A couple of weeks ago we were sent a parcel of Peppa goodies as part of our role as a Peppa Pig Holiday Blogger. I’m not quite sure where the time has gone but today I am finally writing my second post and I have a great giveaway to share with you. The Peppa Pig products helped keep my children occupied over the holidays but there were far too many so I’m going to share some of them with you. My children are big Peppa Pig fans. As well as Peppa toys and watching episodes of Peppa Pig they also like to look at the Peppa Pig website. There you can find stories to read, top seasonal episodes, games and a section of things to make. This last section is our favourite and contains Print & Colour and Peppa’s Activity Maker. 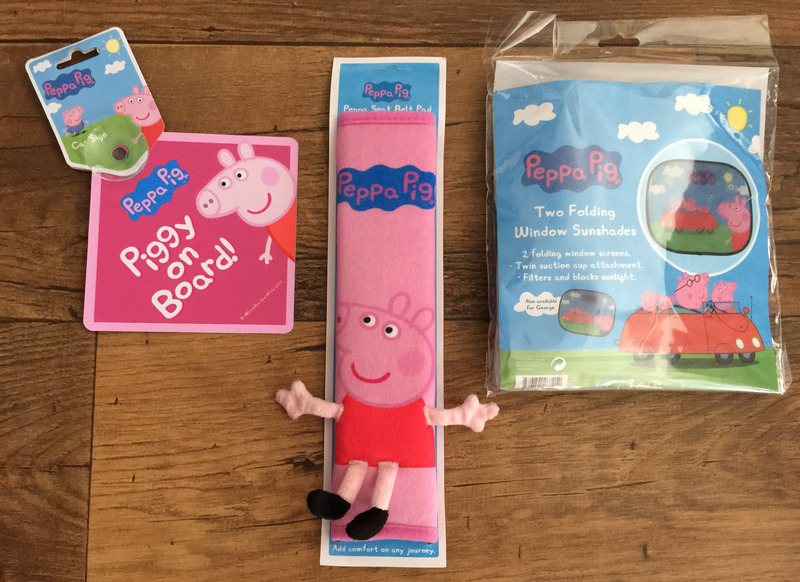 For your chance to win some fun Peppa Pig themed travel accessories simply complete the Rafflecopter widget below and leave a comment on this post. We always take an ipad or tablet so we can access the internet or keep the kids amused in a pinch! Please don’t laugh but it’s teabags – I cannot cope without a nice strong English brew every morning! My trusty Kindle – only time I get to catch up with some reading! My phone for emergencies and to occupy the toddler on journeys, things like suncream can be bought if forgotten. Books, and lots of them! A tablet filled with books and music. suncream and a picnic blanket! Baby Wipes! sticky hands are no fun! Sun cream…can’t have my little piglets getting burnt! SPF, dont want to risk getting sun burn! Suncream – I burn baby burn! A satnav. I’ve got no sense of direction! Sun cream, we’re all fair skinned so we burn easily! Suncream as i’m fair skinned. First aid kit with loads of plasters (which are always needed a lot more than they should be needed). Entertainment for Zoe – books for the car seem to keep her quiet at the minute! Without a doubt, my absolute holiday essential has to be sun cream! My Kindle – can’t live without it. I’ve got to have my SPF30 lip balm!